Lean Sigma Institute what is Lean Six Sigma LeanSigma ? Below are frequently asked questions raised by Management. + Can we use lean or Six Sigma alone? + Shall we use Lean and Six Sigma together? + If we want to adopt Lean and Six Sigma together, how? + Which one goes first? + How will we know if we're doing it right? Lean tools are traditionally developed by Industrial Engineering to improve productivity and eliminate wastes while Six Sigma tools are originally used by Quality Engineering to improve quality, reliability and defect level of products and services. The barrier of these two engineering disciplines are diminishing slowly and both are converging into a new powerful and practical discipline, namely as Lean Six Sigma in general and LeanSigma X-Plan and Service Lean Sigma and Lean Sigma Design under our own branded service. Lean. Focus in eliminating non-value added waste in a process with goal of reducing process cycle times, improving on-time delivery performance and reducing cost. Six Sigma. Using statistical techniques to understand, measure and reduce process variation with the primary goal of achieving improvements in service quality and cost. Lean Six Sigma. An integrated and balanced combination of the speed and variation reduction power of both Lean and Six Sigma to achieve business management process full optimization. Six Sigma is deployed mainly for innovative, breakthrough and continual improvements under the black belt projects led by Black Belts and Master Black Belts while Lean is deployed mainly for daily continual improvements and performance sustaining activities under the lean kaizen events led by Line Engineers and Supervisors. 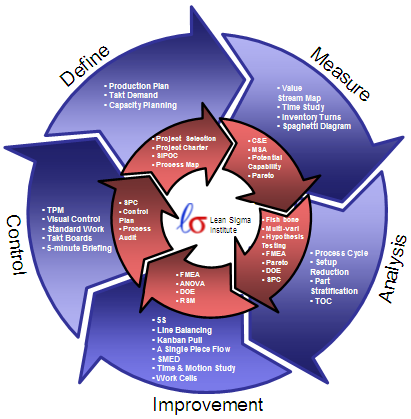 Why do we need Lean Six Sigma? This below chart illustrates more steps in the process bring down the overall yield at various sigma level. Note: This chart is modified from a study done by Motorola Six Sigma Research Institute. - Lean eliminates non-value added steps or waste from the process. 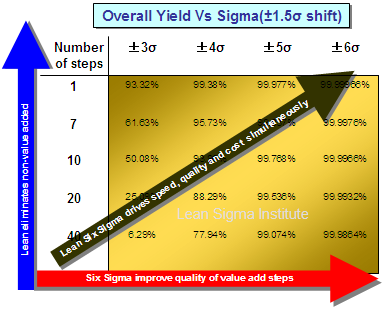 - Six Sigma improve quality of value add steps by reducing the variability in the process.